Peterborough League officials Keith Sharp (left) and Alan Mutton (right) receive a national award from Nigel Winterburn. Arsenal weren’t the only winners at Wembley on Sunday (August 2). Before the Community Shield final the 2015 FA Community Awards national ceremony took place and the ChromaSport & Trophies Peterborough League were there to collect an award after being named winners of the prestigious FA Charter Standard League of the Year Award. The FA and McDonald’s Community Awards, now in their sixth year, recognise and celebrate volunteers, coaches, clubs and leagues across England whose hard work ensures the ongoing success grassroots football in local communities. 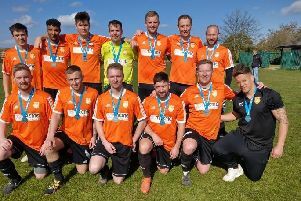 The Peterborough & District Football League achieved Charter Standard status in 2011 and since then has continued to grow and now offers football to over 100 teams from the local area including a veteran’s league. The league has been championing the FA Charter Standard scheme and now boasts 99% of clubs within their set-up have achieved this through their guidance. Not content with this, they are also striving for more clubs to achieve Community and Development status. In conjunction with Job Centre Placement Providers, they give opportunities for long term unemployed and disabled workers to gain experience. As well as supporting clubs through this programme to support their ground staff. In January 2014, the League established a Youth Committee to help the League and support clubs with projects including two successful Drop-in Centres, providing additional players that have joined affiliated football within various local Leagues. At the ceremony on Sunday, the Peterborough & District League collected their award from football legend Nigel Winterburn, ahead of the FA Community Shield which was hotly contested by football giants Arsenal and Chelsea. At the half time break, the Peterborough & District League then joined World Cup winner Sir Geoff on the pitch in front of the capacity crowd. The national ceremony, held at the curtain raiser for this year’s football season, took place after thousands of nominations were received across the nation, with grassroots football volunteers, clubs and leagues being recognised at county and regional level, for this year’s FA and McDonald’s Community Awards.